Ender’s Game is a cut above the typical sci-fi spectacle thanks to a thematically-rich storyline that can be interpreted on more than one level. Ender’s Game begins with the above quote and attribution. It’s a profound thought and it’s from a guy named A.E. Wiggin. Not Nietzsche. Not Gandhi. Who the heck is A.E. Wiggin? Well, the “E” stands for Ender. He’s the lead character in this space epic. Clearly, the intent is to create a whole new movie franchise out of this story about a very young warrior. Much like how John Carter figured into a lengthy series of books by Edgar Rice Burroughs, the Ender universe is chronicled in something on the order of 21 books by Orson Scott Card. It’s interesting to note this tale’s genesis dates back to 1977, the year in which Star Wars premiered. And, like John Carter, Ender’s Game is a big budget extravaganza that is in no way a shoo-in for blockbuster glory — and Orson Scott Card’s personal beliefs, which have raised calls for a boycott of the movie, won’t be discussed here beyond this sentence. On the surface, the movie looks like it’s going to be an update to The Last Starfighter, a movie released in 1984 that sported an unprecedented amount of computer-generated special effects and a goofy storyline about a video game aficionado saving the universe. 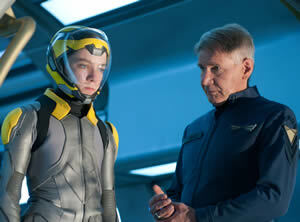 Thankfully, Ender’s Game is much, much more sophisticated in themes and presentation. There’s plenty to enjoy on the surface, but there’s more fun to be had by thinking about the ideas and subtleties lying beneath the glossy effects, sets and costumes. Here’s the premise behind Ender’s saga: in the future, children are trained for interstellar combat because they are innately able to handle complex tasks and multi-faceted decision making better than their progenitors thanks, in part, to their training by way of immersive video games. It’s a concept grounded in a modern reality: it’s second nature for infants to pick up and play with iPads with tremendous ease while — some — adults, mentally boxed in, still need to be told “CLICK HERE” on a Web page because they are totally ignorant of the interactive visual cues of the Internet. Children — pre-teens and early teens — being sent off to war is merely one high-level idea in Ender’s Game. Earth has suffered under unsustainable population growth much like their major interstellar threat, the Formics, an ant-like species that invaded Earth and has since been entangled in a decades-long war. At one point it’s mentioned the Formic war machine has been silent for 50 years, but the goal of the International Fleet is to stage a war to end all wars and thereby secure a peaceful future. Think World War I and its immediate segue into World War II. Is peace a real possibility? Maybe. Maybe not. For Ender — a genius savior of Earth, a leader akin to Dune’s Paul Atreides, only younger — the strategies and tactics of combat are a natural and he’s the one chosen to lead Earth into that last stand against the Formics. At one point, it is commented that Earth needs a new Napoleon or Julius Caesar. Granted, both accomplished quite a bit, but neither ended very well. The point, though, is the need for a visionary with guts to execute on that vision. Ender finds himself perpetually challenged by virtual combat tests, simulator sessions and a mysterious video game challenge that digs into his mind for emotional triggers. Dealing with rejection, frustration and combative personalities, Ender has to navigate his way through the ranks, somewhat like a puppet with Colonel Graff (Harrison Ford) as the puppet master. Graff sees the potential in the awkwardly skinny — but wiry — Ender (Asa Butterfield) and he’s willing to push Ender beyond his perceived limits. Going back to that opening quote, there’s an emphasis on the need to understand the enemy. That’s something, until Ender, nobody’s been able to accomplish. The enemy’s the bad guy, that’s the extent of wisdom carried down from generations past. That’s not a particularly helpful nugget of genius to latch onto, as conflict after conflict in world history will attest. Knowing the enemy entails hunkering down and understanding where they’re coming from and why; understand what’s brought them to take the actions they have and there’s probably an angle that can be exploited to the adversary’s advantage. As Ender’s epic story unfolds, he reaches a point where he sets his sights on a new challenge: to be as successful at peace as he is at war. Thematically, it’s all pulled together rather nicely by director/screenwriter Gavin Hood, who pulled the same double duty with his adaptation of Atol Fugard’s Tsotsi. Digging deeper into the nuances of the training sessions Ender and the other recruits go through, there’s a pretty cool and smart guidebook for navigating not only through combat, but life in business and life in general. Given the enduring popularity of Sun Tzu’s The Art of War in business — or at least business academia — perhaps it’s not such a big surprise the material can be read in that context, but it is a fun spin to go back through and revisit. While watching Ender’s Game and seeing Harrison Ford onscreen there’s a comforting feeling — at least during the two hours experienced in the friendly confines of the movie theatre — that all is right with the world. This has been a good year for Ford, and a long time coming. With 42 in the spring and Ender’s Game in the fall, it’s easy enough to forget about Paranoia in the summer. Paranoia? What Paranoia? Relying on such a large cast of young actors — too young to be fully emotionally baked — is a risky proposition, but it works here. In particular, Butterfield is credible and likable as the young warrior mature beyond his years and Abigail Breslin (herself a 10-year-old Oscar nominee for Little Miss Sunshine) is terrific in a relatively minor role as Ender’s sister, Valentine. While the action itself isn’t executed at a Star Wars level — rather than zooming through space in an X-Wing like Luke Skywalker, Ender is the war’s tactical genius, more like Capt. Kirk on the Enterprise — the story and the characters are engaging enough to compensate for the lack of whiz-bang action set pieces. This isn’t merely an escapist fantasy and, in a marketplace flooded with confections, it’s nice to have something more substantive to fill the mind with meat and the eyes with candy.